After a full day up the mountain getting your ski/board on, all of that fresh air is going to make you feel decidedly parched but luckily there are a host of lively, welcoming establishments ready to quench your thirst down in the valley. This is a brief insider’s guide to hitting some of the best spots in town at the best times, so you can avoid traipsing around in your ski boots like a chump. Chamber Neuf, situated just opposite the train station in the centre of town, is arguably one of the best bars to start. With live bands playing every night except Saturdays, from 5-7pm, and dancing on the tables actively encouraged, it is guaranteed to get you in the party atmosphere. This lively bar is famous for the giant moose head placed in pride of place on the wall in front of the door, so watch your head when you’re dancing on the tables. Opposite Chambre Neuf you will find the slightly more relaxed, though still buzzing, Elevation 1904. A regular haunt of the French locals, it’s a good place to sit back with a jug of something cold and have a laugh over the funniest falls of the day. There is normally a DJ on in the evening, keeping things lively and they also have a good bar snack menu, as well as seating outside to watch the world go by. Take note for the next morning that they also do a very tasty full English breakfast. Monkey Bar, located in Chamonix Sud, about a 10 minute walk from the town centre, has its happy “hour” from 4-6pm on beers and wines. Very popular with the locals all year round, they have regular live music and their very own ping pong table outside to challenge your mates. There is a delicious bar menu featuring regular meal deals (on Mondays it’s 50% off their famous burgers from 6-8pm). Stay until 9pm and then its 2 for 1 cocktails, though a word of warning, two pints of their notorious long island iced teas have the ability to tip even the best of us over the edge… open ‘til 2am if you make it past cocktail hour! La Terrasse occupies a nice central location in one of the main squares in town, next to the river. As the name would suggest, it boasts a south-west facing terrace to sit back and grab a beer whilst enjoying the famous Mont Blanc Massif views. With several popular live music events per week, you could happily spend the whole evening here. Step upstairs into the recently renovated, art nouveau-style lounge area and you can grab a cocktail or a bite to eat from the delicious bar menu. Micro Brasserie de Chamonix (MBC) is well worth the 5 minute walk from the town centre. Invariably full from early on in the evening, both locals and tourists alike flock through the doors to sample its home brewed delights, made from Chamonix’s clean, glacial supplied water. They brew and serve a total of 6 beers and pride themselves on adding no preservatives or additives. MBC also has a full bar of other drinks, should you fancy something different and a great food menu that’s become well known for it’s chicken wings. Live bands play weekly, as well as DJ’s and acoustic sets in between. 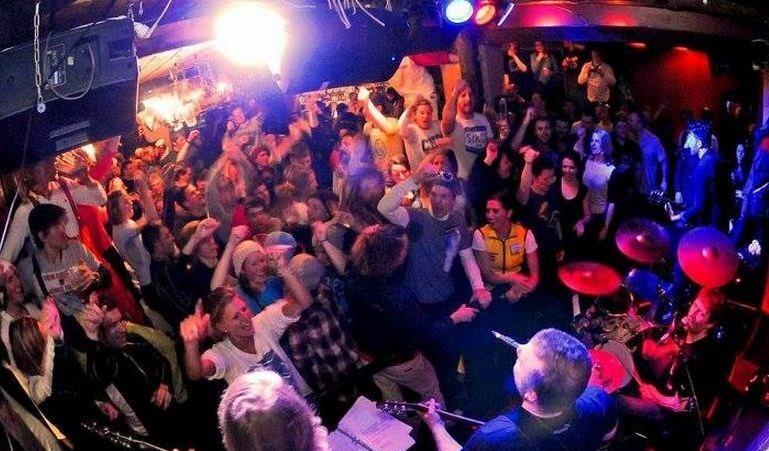 Nestled at one end of the famous Rue des Moulins, Bar’d Up is one of the most laid back venues in Chamonix. With its surf-shack atmosphere, complete with a surfboard on the wall signed by Kelly Slater himself, and its warm, friendly environment, it’s a great place to chill out with a reasonably priced beer and warm up for your evening. One of the few bars in central Chamonix to show the football, they also boast a number of bar games so you can challenge your mates to a round of pool, darts or table football. The Vagabond, just past Chamonix Sud, is cosy, friendly and welcoming. It’s the perfect place to perch yourself at the bar and have a chat with some of the locals, whilst enjoying the warmth from the open fireplace. With an amazing whiskey selection for such a small place, it also has its own happy hour from 4.30-6pm, with some very reasonable prices to soothe your weekly budget. Cha’ Cha’ Cha’ is a relaxed but elegant wine and spirits bar/merchants, located at the west end of the pedestrianised area. Perfect for a chilled out pre-prandial or to spend a few tranquil hours sampling some of the valley’s finest selections. The knowledgeable, friendly staff are extremely helpful in picking the perfect bottle. They also have regular wine and whiskey tasting sessions where you can expand your knowledge and deepen your appreciation of your beverages. Bar du Moulin, situated slap bang in the middle of Rue des Moulins, is the spot to go to get the party started. Hidden underneath the Cap Horn restaurant, it serves a delicious range of cocktails, with fresh ones added weekly, and always has some cool tunes playing, with regular DJ slots. The staff are friendly and welcoming and get well involved in the fun. One of the only bars in Chamonix where you and your friends can drink a ski-shot together – it has to be done once! Maison des Artistes (or The Jazz Bar, as the locals call it) was once the home of former mayor of Chamonix, Maurice Herzog. It was restored last year and opened as Cham’s only Jazz bar, welcoming artists from all over the world who also have the chance to make use of the recording studio. The place is tastefully decorated and provides a slightly more refined atmosphere than some of the more casual après bars. You can dress up to the nines and not feel out of place here. That said, it is not in any way pretentious and the staff offer very good service whilst being super friendly. Barberousse (or The Pirate Bar to the locals) is just inside an alleyway that leads off of the same square that La Terrasse is situated on. Boasting an impressive selection of over 100 different flavours of rum, you can try to work your way through them all, as they are very reasonably priced at only €2.50 for a shot or €15 for a bottle. They also have a dedicated smoking den below deck, so you don’t have to venture outside into the cold. Without giving too much away, should you be curious to tackle their shot challenge it involves a helmet and a series of blunt objects that culminates in a fire extinguisher… bonne chance! Arguably the most popular nightclub in Chamonix, Amnesia is where everyone will invariably end up at 3am. With everything that you could want at that time in the morning, including lasers, smashing tunes and hot bar staff serving cold beverages, it is guaranteed that everyone there will be on the dance floor getting groovy. Bunker is conveniently located at the end of Rue des Moulins, in one of the arches underneath the bridge. It features, as the name might suggest, a bit of a soviet Russia theme to the décor and as you enter through the long corridor you feel like you are plunging back into the cold war. With admission usually free, they put on some good DJ nights and normally stay open until the early hours, so this is the place to head when everything else is closing. Renowned as one of the friendliest night spots, Le Tof extends a warm welcome to everyone, as well as being the only gay bar in town. Set in a basement in Cham Sud and boasting its very own dance pole, it is small but intimate and you are almost guaranteed to end up having a chat and a dance with one of the lively regulars. They play some banging tunes that lean towards a retro-pop theme and serve reasonably priced drinks for that time of night. Its doors are open until 4am.